As the graphic communications industry continues to evolve from a print-centric to a communications-centric industry, many service-providers, enterprises, and graphic communications departments are looking to master 1:1 cross-media communications technologies. For the service businesses, this is a critical stepping stone for becoming providers of the non-commodity, higher-value and longer-term services that individualization in marketing and other business disciplines demand. However, such a shift in business focus is not trivial. 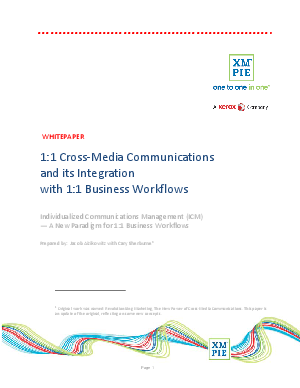 The goal of this paper is to help the reader understand what 1:1 cross-media communications is all about, what are the benefits to be gained, and what kind of investments are needed in order to realize these benefits.